Although Armi Raita, the founder of Marimekko did not design the classic Maribowl bowls herself they have come to be associated very strongly with her brand. And of course as always when something becomes popular there are other companies that want to copy paste and get their share of the cake. 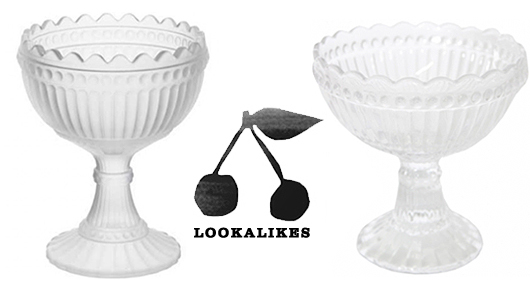 Many cheaper "lookalikes" happily rides on the hype that Marimekko has created for this Karelian glass bowl. Thet latest one that I found are for sale at Chilli Store. But be aware of the details. Check the clarity of the glass, the original Maribowl has no bubbles or imperfections in the glass mass. Also look closely on the intricate details and the thickness of the bowl foot. Last but not least, always make sure there is an embossed logo underneath it (if you turn it upside down check the bottom of the bowls foot). Maribowl is available in clear glass, frosted glass and a variety of colors. And so are many of its lookalikes too so be careful!